In our previous post on Magic: The Gathering, we noted the naturalistic concept of mana which underlies both the premise and mechanics of the game. Today, we will begin examining this particular facet of Magic, with an eye for the religious implications of this fundamental concept of the game. The word "mana" comes from the Maori language, and refers to a pervasive spiritual force which accumulates in animate and inanimate objects. Somewhat by extension, the word has come to be used to mean controllable magical power, and it is with this connotation that "mana" became a common term in modern fantasy literature and games. In the latter context it usually denotes the actual "magic points" available to the player, as is the case in Magic. 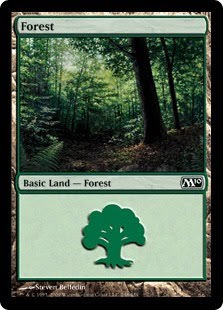 This Forest card represents the player's mana bond with an actual forest they've notionally visited and connected with somewhere in the vast game world. To play this card is to open a link with that land, and to tap it (an action indicated in-game by turning the card sideways) is to draw upon that link and summon up mana from that place, wherever it is. The more land cards one plays over the course of a game of Magic, the more mana bonds one has readied, and the more magical stuff is at one's disposal to cast spells. So far, we've seen that the game's mechanical device representationally reproduces the animistic idea of living land as a source of spiritual or magical power. Next time, we will expand on this simple observation to take into account the five colors of mana produced by the five types of basic lands, and the cosmology implied by the classification of all phenomena according to those five colors' characteristics.